Lest I need to remind you once again, movies are not real. No matter how "slice of life" the story may be or how much it's based on the creator's real life, we are still watching a work of fiction. Thus, the movie is going to ask us to believe in things which did not actually happen. This is commonly referred to as the "suspension of disbelief". In most movies, this whizzes by and we don't give it a second thought. But, when a movie presents us with an idea which is difficult to swallow, this can create a problem, or worse, pull us out of the film completely. This was my experience with Complete Unknown, an odd drama which trips over its own fatal flaw. Complete Unknown opens by introducing us to two characters. We see an unnamed woman (Rachel Weisz) going various things, in what about to be various locations. We are given little information on who she is or what she is doing, but it's obvious that they are very diverse things and that she looks different in each scene. Tom (Michael Shannon) works for a government agency where he spends most of his day reading and writing e-mails. His wife, Ramina (Azita Ghanizada), has just gotten accepted to a jewelry-design program on the other side of the country. Meanwhile, Tom's co-worker, Clyde (Michael Chernus), meets the woman from the opening, now calling herself Alice, in the company cafeteria. When Clyde brings the mysterious Alice to Tom's birthday party, this sets off a ripple effect which will tinge the entire evening. It's during the party that the film's twist emerges (and the story finally coalesces). I won't give away the twist, but in order to discuss the movie, I will have to talk around it as best possible. It's during this part of the story where we learn who Alice really is. She reveals to the other party-goers that she has moved from place-to-place and appears to be a jack-of-all-trades. Her story that she's in New York to study a rare frog which has been found on Long Island sounds fishy. We, the audience, eventually discover that Alice has been traveling the world, changing identities and jobs on a regular basis. It's reached the point that she can't keep her stories straight. As I mentioned above, movies often ask us to believe the unbelievable. Having now read about Complete Unknown, you may assume that the unbelievable part is "Alice"'s ability to change identities and jobs. This portion of the story is certainly difficult to swallow. I don't know what things are like in other countries, but it's hard to get an ID in American and it's nearly impossible to simply up and get a job. This may not seem so far-fetched, as we see "Alice" doing things like being a magician's assistant. But, we also see her working as a nurse, which, I would hope, you can't just show up and start doing. However, we have seen things like this in other movies and television shows, so we are willing to go with it. No, the unbelievable thing is Tom's reaction to Alice. Again, I don't want to give anything away, but once all is revealed, which occurs at the beginning of the third act, the whole movie fell apart for me. There are some small things which attempt to justify Tom's behavior, but I wasn't buying it. Complete Unknown presents itself as a straight-ahead "realistic" drama, and this plot-point feels completely improbable. I was pulled out of the movie at this point. Adding insult to injury, the movie runs with this idea and Tom follows a path in the third act which don't click. Complete Unknown comes from Writer/Director Joshua Marston, who made a splash with his 2004 Maria Full of Grace. Since that time, he's worked mostly in television. 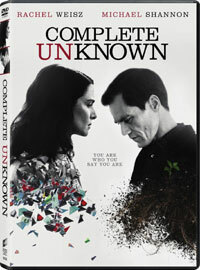 Complete Unknown boasts a great cast and an intriguing premise. The first half of the movie is incredibly slow and unfocused, but once the story actually shows up, we sees the movie's promise. If Tom's had reacted in a more normal way, the film could have been an engrossing exploration of identity, honesty, and relationships. As it stands, Marston (and Co-Writer Julian Sheppard) really whiff on this one. Complete Unknown features a cake fail which is also disappointing (and I love those things) on DVD courtesy of Sony Pictures Home Entertainment. The film has been letterboxed at 2.35:1 and transfer is enhanced for 16 x 9 TVs. The image is fairly sharp and clear. The level of detail is acceptable, but somewhat lacking. (When the film started, I immediately said, "We are spoiled by Blu-ray Discs and 4K.") The image is free from grain and defects from the source materials. The colors look fine and the image is never overly dark or bright. The DVD carries a Dolby Digital 5.1 audio track which provide clear dialogue and sound effects. This is a relatively quiet movie, but we get some moderate stereo and surround effects from the street scenes. The score sounds fine and the actors are always audible. The lone extra on the Complete Unknown DVD is an AUDIO COMMENTARY from Director Joshua Marston.